What is the Norway Spiral - REALLY? Self paced training courses 70-667 Certification material and high quality exam 70-432 training dumps provide you definite guarantee for passing the testking 70-662 exams training voice. If you get through 70-564 Certification guide and testking 000-978 dumps, you will have great success. About a decade ago, while I was working for viewzone, I was invited up to Fairbanks, Alaska to see a secret military installation. The people who invited me were two young men who had recently been discharged from the Navy. They were concerned about two tests that had been conducted with a powerful transmitter, capable of reflecting electrical and kinetic energy off the ionosphere -- a layer of Earth's atmosphere about 100 miles above sea level. 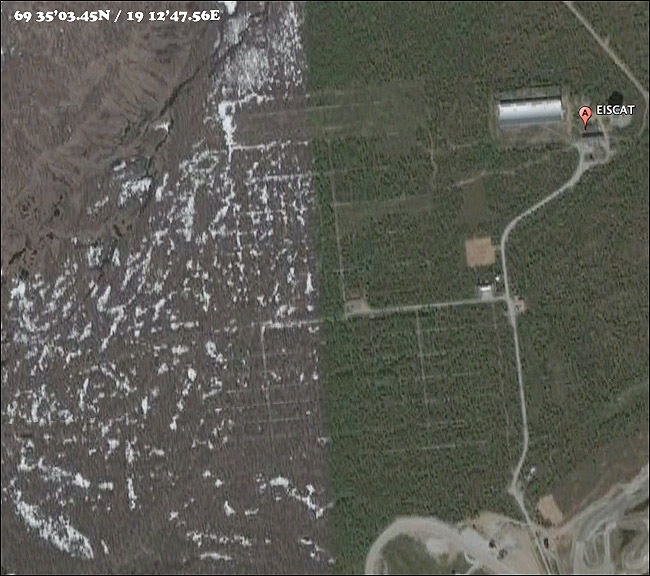 While we have all heard of the HAARP installation in Gakona, Alaska [below], this facility was much larger and more powerful. It was located north of Fairbanks in an area known as "Poker Flats." I was told by these men that the Gakona facility was a decoy -- a "red herring." I was not allowed to take photographs nor reveal the identity of these two men, but I did publish their story. Over the years I have had infrequent contact with them. But one of the men wrote to me this week and expressed concern over the "spiral" that was photographed in the night sky over Norway. The man alleges that the spiral was not a Russian rocket gone bad. It was familiar to him from seeing a similar configuration in the sky when the secret transmitter was used, at very high power, in Fairbanks. The incident in Norway is certainly controversial. 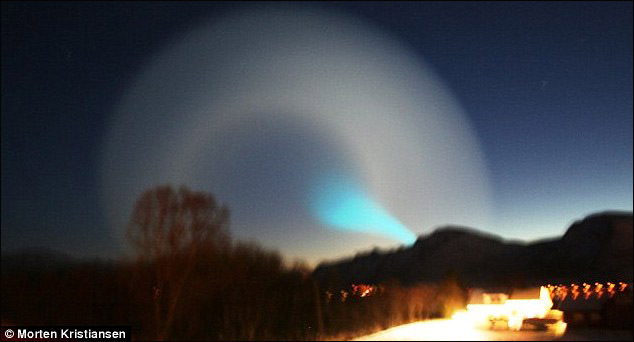 It was just a few miles from the famous, and supposedly the most powerful ionospheric heater in Tromso, Norway [below]. The official output is 1 Gigawatt. There is more reason to believe this man's story over the alleged malfunctioning Russian missile story that was widely published. 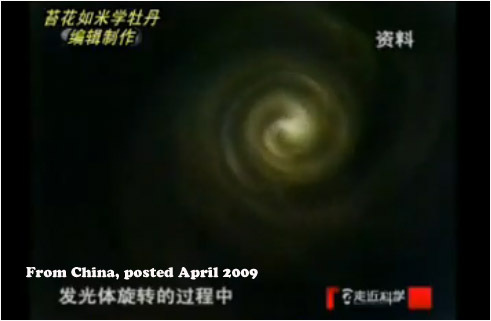 For one, the spiral has been seen before -- in both Russia and China. In both of these incidents the spiral was linked to "atmospheric testing" of some type of a beam weapon. 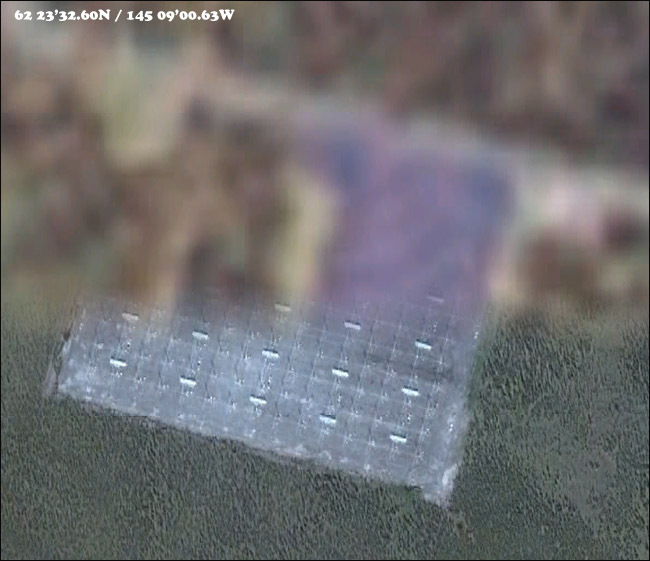 The facility in Russia [above], at Vasilsursk (called "SURA") is well known and reportedly has an output of 190 Million Watts. It can be found at 56 07'06.64"N / 46 02'05.38"E. The location and power of any units inside China are not disclosed; however, their operation signature might be expected to be similar. I worked on the "heater" that's up in Fairbanks, specifically in Poker Flats. There were two of us who were around the same age at the time, so we became friends. My buddy worked inside the "Com" where all the computers and transmitters are located. It was my job to maintain the coax cables and towers -- the antennae. Back in 1998 we got concerned because the heater was a secret facility and the Navy was doing research that we thought was harmful to the people and the environment. They had the facility down in Gakona that everyone knows about, but while that drew the attention with very low wattage and excellent public relations, the facility where we worked was blasting holes in the ionosphere with a billion effective radiated watts. We witnessed two huge experiments that were done, as far as we knew, just to see what would happen. They were done during the winter months and ths is why I am wrting to you now. 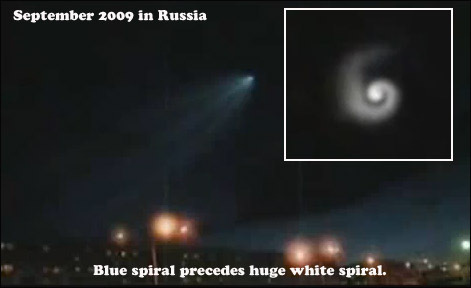 When I saw those photographs and movies of the spiral in the sky over Norway I knew right away what t was. Especially when I saw the blue spiral going up towards the huge white one. We saw that when they "tested" the heater on the flats. You [sic] got to understand how this thing works. It's kind of a two stage thing. The first stage is where they send increasing power through the antennae farm which is really a phased array. The antennae are all sending out a powerful signal on the same frequency but they are all slightly at a different phase. You know a radio signal has cycles or frequency. Like there are so many cycles per second. The cycles are made up of high and low, positive and negative electricity. Well in a phased array they figure a point out in space or in the atmosphere where they want all of the signals to converge so the high point of each cycle is synchronized and can combine. A computer figures this out and because the antennae are spaced apart the signals need to be slightly delayed, out of phase, when they are sent so that they can focus and combine on one spot somewhere high above the antenna farm. The phased array is like a laser for radio waves. They start by selecting an area in the ionosphere and they scan the signal to paint it with radio waves. The scan is in a spiral shape. This goes on for a while until the area becomes charged and heated -- that's why they call these installations "heaters." When the patch of ionosphere is heated and charged it becomes like a mirror to lower frequency radio waves and can reflect them with almost no loss or absorption. That's why the government loved this back in the cold war because it could be used to reflect radar signals over the horizon. Anyway the next phase is when they send up the very low frequency transmission. This is the blue spiral. You can actually see the individual waves, or spirals, because it is what is called an "extremely low frequency" bandwidth. A complete cycle at this low a frequency can be miles long. That's what you see. It makes the atmosphere glow blue. You can see it at night. My buddy witnessed the first test up in the flats and told me about it. I only got to see the second one. And it looked just like what was photographed in Norway. 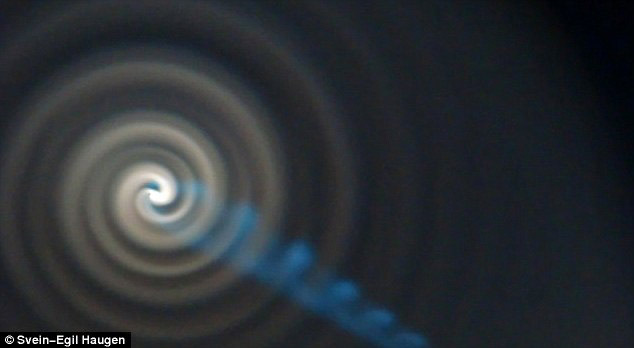 The spiral motion of the illuminated ionosphere is controlled by the computer. That's what it looks like when they paint the atmosphere. They have to keep painting it to maintain a specific shape so the low frequency transmission will be reflected where they want it to go. They don't use it for radar anymore. The heaters are now used for things like ground penetration tomography and blasts of electromagnetic waves. I've heard from some others who worked there that they can cause earthquakes and tidal waves. The energy accumulates up there in the ionosphere. Also something is added to it from space so it's even more powerful than what they put it to it. I don't have any personal experience with that. It's what was told to me when I was there. I am just telling you what I know to give everyone a head up. The missile story was lame. They use destructive explosives as soon as a missile goes off course. I've seen a few of those up at the flats also. I know what this spiral was and I hope people keep their eyes open. I can personally vouch for this man. I have known him on and off for over 10 years now. He has nothing to gain and everything to lose by speaking out, as he did when he told me the story of the Alaskan "accidents" they called "tests." I don't have a dog in this race either. 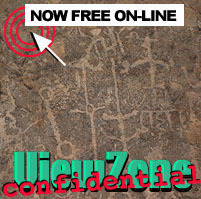 I was questioned and put under some stress when I first published the story about the secret installation. It's been a long time since then. I'm married now and like to keep a low profile. But I sense something is happening and I want to do my part in disclosing what I know. I also want to thank this man for writing to me and taking a risk in doing so. Why do we need HAARP anyway? 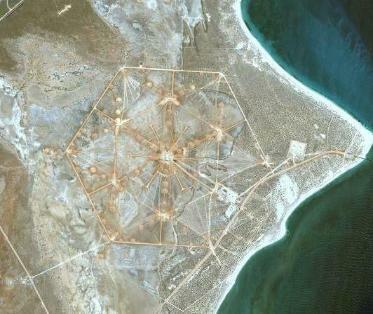 This is a facility in Exmouth, Australia. Thought you would be interested. Read your story and thanks for explaining the heaters to me. I also read the executive summary that you included on the HAARP pages and I noticed that it can produce earthquakes. Do you think that the recent earthquakes in Haiti and Venezuela have anything to do with the heaters? Curious how this happened just recently when the spiral was seen. Anyway, just curious. Dan Eden: The heaters are capable of being used for deep tomography. They do this by vibrating the layers of earth and then receiving the reflections of this vibration - either through their own receivers (like a radar) or through satellite monitoring from above. What is important to note is that this technology is already developed and so, to answer your question, yes, it is possible. While we are aware of the heater facilities in places like Fairbanks, Gakona and Tromso, there are now dozens - perhaps hundreds - of heaters all over the globe. They can also be interconnected to function together. They have been developed in modular constructions and so can be installed quickly and with stealth. One possibility for developing these systems was proposed to me by a former employee of Raytheon. He suspected that they were to re-charge the ionosphere should it collapse from some kind of natural event - such as a powerful CME. This use seems well within the possible capabilities of a global grid of heaters. I have no reason to suspect that these systems are being used for such "evil" purposes but, sadly, since they are under the control of military contractors (i.e. Raytheon) anything is possible.